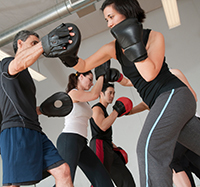 Muay Thai Kick Boxing Classes improve Strength, Flexibility, Endurance and Mental Focus. These classes are non-conta and contact based. People of all fitness levels are welcome at BluCoral Fit, and no experience is necessary to enjoy this all-body, stress-releasing, confidence-boosting workout. Whether you are used to working out, have gotten away from the habit, or this is your first workout ever, the Coaches will work with you to increase your fitness level. Muay Thai Kick Boxing Classes improve Strength, Flexibility, Endurance and Mental Focus. These classes are non-conta and contact based. People of all fitness levels are welcome a BluCoral Fit and no experience is necessary to enjoy this all-body, stress-releasing, confidence-boosting workout. Whether you are used to working out, have gotten away from the habit, or this is your first workout ever, the Coaches will work with you to increase your fitness level. All Muay Thai Kick Boxing requires Muay Thai gloves, chest guard, shin guards and 180 mexican wrist wraps. In the Muay Thai Kick Boxing Class you will use 8 Limbs Style: Kicks, Arms, Elbows and Knee's! TRX Suspension Training: It is not as easy as it might seem! Most everyone finds TRX challenging at first. You’ll get better at it. It’s an excellent, rewarding exercise. Get in shape: In addition you’ll do Medicine Ball drills, plyometric exercises, punching and footwork drills to give you greater stamina, muscle tone and lean muscle mass. You’ll increase your energy, flexibility, strength and coordination. Assume and maintain correct posture: Proper alignment is essential for boxing. You will learn to line up your muscles correctly in the gym, which will increase your body-awareness in everyday life. Punch at a target: Punching a heavy bag or focus mitts is great fun, an excellent all-body workout and a good way to release pent-up emotion or stress. Learn how to achieve personal goals: When you work out you learn how to set goals and achieve them. This knowledge carries over into everyday life. •	Begin with non-contact Drills – Perfect your footwork, range and strengthen your cover. Basic Defense Drill - Block, Parry, Slip Straights, Block, Duck and Rockaway Hooks. Counterpunch Drills, beginning with Focus Mitts – Establish timing to turn reaction into response. Move and Punch Drills – Deliver punches at Sparring Partner with light contact. Sparring – Advance to light sparring and progress at your own pace to all punches in the ring. Contact and non-contact options: All Youth start with non-contact drills. If the Youth is interested, there are options for contact sparring drills as his or her skill-level increases. Convenient Schedule: Monday-Sunday for ages 13-17; ages 8-12 call for scheduling. Year Round Program: Perfect for cross-training, getting in shape, and acquiring skill. Buy your own gear contact us or we can tell you what to order for Mauy Thai Kick Boxing. You must have boxing gear in order to participate in class.